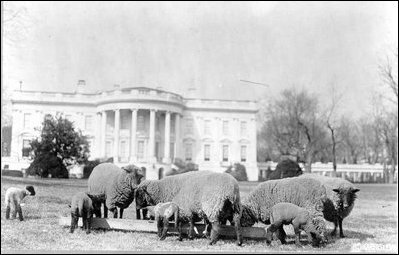 Sheep on the White House lawn? By 1915, the U.S. Department of Agriculture was collaborating with the U.S. Golf Association to find the right grassor combination of grassesthat would create a durable, attractive lawn suitable to the variety of climates found in America. Included in the testing were Bermuda grass from Africa, blue grass from Europe, and a mix of Fescues and bent grass. Fifteen years later, the USDA had discovered several grass combinations that would work in our climate. We were off and running, to find the most suitable pesticides, herbicides, and fertilizers that would protect and serve newly blended mix of grasses. After all, now that we had a good grass blend, we couldn't let it starve or be eaten alive by some hungry pest, or succumb to some nasty disease.